You may have turned your website into an opt-in machine. And maybe you write subject lines so alluring, they’re like a siren calling your readers to open. But if people aren’t clicking, you aren’t driving an impact. 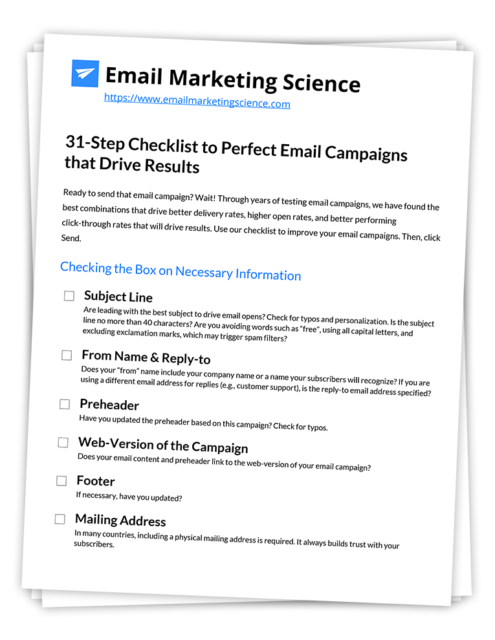 Email marketers glamorize their list size. They even brag about them. But I would take clicks over a larger, unengaged audience. In this guide, we’re going to build on the work you have done. We’re going to focus on what we need to do to get people to click. Have you noticed we rarely have paragraphs of text on your website? Because nobody has time for that. And they definitely don’t have the patience. Your recipients do not have time to read all of your emails even if they all have precise formatting. It’s critical to make it easier to scan your email newsletter. Images can draw the eye, so where they’re located on an email newsletter can affect the readability. All of your content – images, subheads, everything – should make the most crucial call to action clear. Use bullet points or subheads to lead recipients to your call to action. Marketers can subdivide their email newsletter into sections and use the first section to showcase the most important action item. Making your messages scannable is one our the most important strategies will will ever learn. If people don’t read, or if it don’t pay attention, they can’t act. Email marketing providers showcase their beautiful themes and templates. But you know what often works best? Plain text emails. In a world with glossy marketing emails, sometimes readers associate plain text with a letter from a friend. The only problem with plain text emails is that the reader will get ugly links. Plus, it limits room for design tweaks and makes it hard to track clicks. So we strike a balance. Use a plain text HTML email. This approach will make your links look clean and increase the flexibility of your design, It will also make it easier to analyze email statistics. Look at the tone, and the clean hyperlinks. This email looks like a plain text email to the casual observer, but it’s actually an HTML email. This is a highly refined campaign. Your content is what leads subscribers to click and open your email. But it will take a couple of tries to make your content more engaging. Readers are likely to respond to visual stimuli, so if you have an HTML email, consider adding images. GIFs, from a resource like GIPHY, may work even better. Another way to know if your content resonates: ask them. Include a short survey or poll and ask for feedback. Your subscribers are likely to take part in a study, but only if the results will favor them. We use a lot of surveys. 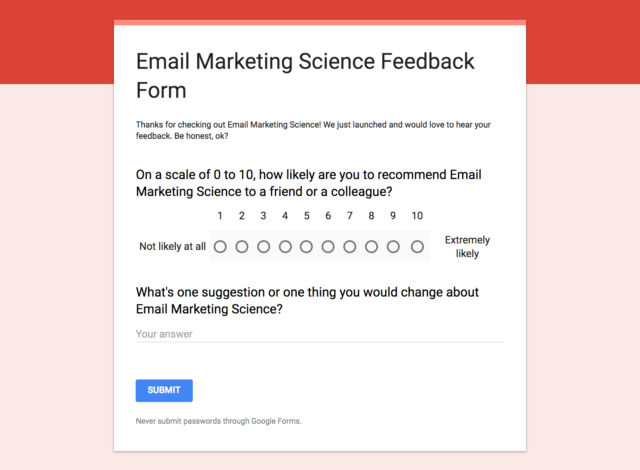 You could do use a service like SurveyMonkey or Typeform, but we use a free alternative: Google forms. We don’t ask readers if they like our content. They’ll give much more limited responses than you would otherwise hear. Instead, we open with a net promoter score question, and then ask what is one thing we could change. The responses are added to a Google Sheets doc for your to review. You won’t believe how valuable this feedback has been for us. If you want to use a beautiful template, make sure it’s formatted correctly. Email marketing newsletter templates should not have a width exceeding 600px. That limit is getting larger now with larger smartphone screens, but it’s a good rule of thumb. Also, stick to a single column. Single column emails tend to drive higher click-through rates than multiple columns. But, above all, if you’re using a template, don’t build your own when you’re just starting out. Email marketing providers have valid and beautiful templates. With most of the emails being read on mobile devices, you need to ensure your template is responsive to the screen size. You also want to use email newsletter templates that can fit your content and brand. And a template will make it easier to edit future email newsletter campaigns. Sometimes your readers will not be wearing their glasses. Or maybe they’re reading your messages on a different, non-traditional device. You want to ensure your messages adapt to these situations. Avoid walls of text that may be difficult to read. Use readable fonts. Use alt text for all images. 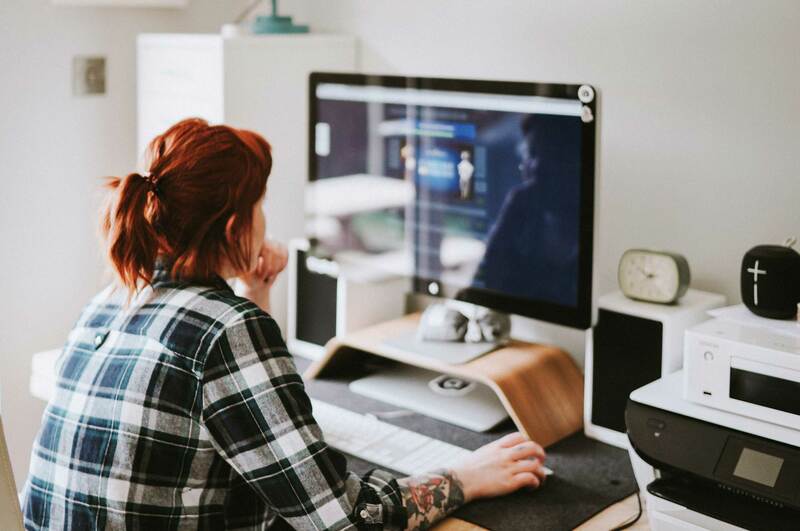 Well-designed emails can be accessed even by people with visual impairments, so don’t neglect email accessibility as part of your email marketing strategy. Email newsletters are part of your marketing strategy and your brand image. 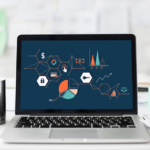 That means an enterprise will need to include an avatar, photo, or logo that it uses across all its social media accounts to their email newsletter. A branded email newsletter make it easier for recipients to recognize your brand and builds trust. Consistency is critical to subscribers, so don’t change the templates of its newsletter every week. Brand all email newsletters with the same template so that recipients can familiarize themselves with it and know what to expect. Keep the templates simple and include the name of the newsletter as well as the brand’s name to make it more appealing. One way to maintain brand consistency is to send email from a recognizable sender. Adding your real name to the email “From” field and asking someone associated with your brand to sign the email can help boost your trust. Subscribers are also likely to respond to an email with a real address instead of a no-reply address. 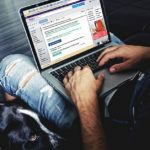 That can help improve future email deliverability as well as the reputation of the sender. Your goal is to drive more traffic to your website and engage visitors with relevant and valuable content. But not in the email message itself. All you want them to do is click! With an email newsletter, your goal is to get your readers to your website or landing page. That’s why keeping your email newsletters short pays off. Email newsletters that are 200 words and below have higher click-through rates than those with more words. 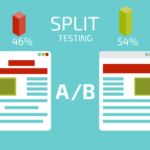 However, using a series of emails to test your audience is the best way to find out what pleases them. Even with short texts, senders can capitalize on a few tips to make their email newsletters more useful than ever. You will have to use eye-catching headlines and share your best content to make more people open your email. Try to use a short introduction, match the brand color with the background theme, and make your call to action as clear as possible. Color influence action. Color intensify brand awareness. And color is beautiful. Even if your logo is blue, you don’t have to stick to the color blue. Color is an excellent way to strike interest. 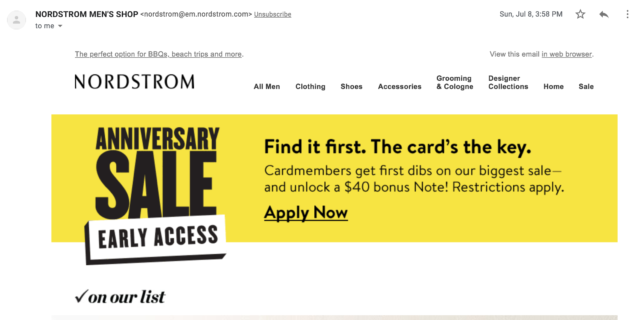 Look at the beginning of this email from apparel retailer Nordstrom. Their logo doesn’t have color, but they used yellow – a color many designers avoid – to make a statement. 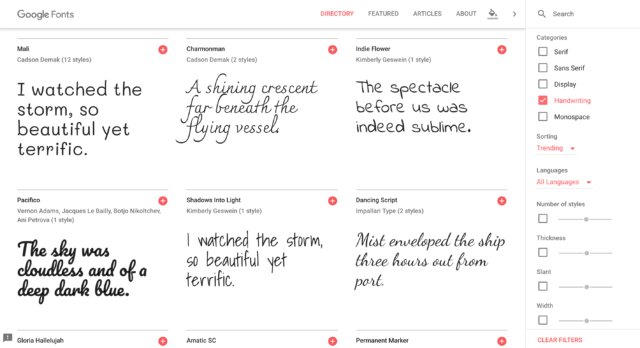 Over the past decade, the web has exploded with the number of beautiful fonts we can use. In the early days of web design, we had to stick with fonts we knew were on every reader’s computer. That’s why we saw Courier, and Times New Roman. And Arial. So, so much Arial. With web fonts, we didn’t have to choose. We went overboard with font selection. Why limit yourself when font limits were imposed by a technical deficiency of the past? This was the future. We replaced our limits with ligatures as we entered a new era of web design, sans serifs. But just like the design decisions of the 1980s, any time the pendulum reaches that point of excessive typographical opulence, it swings back. You need a headline typeface and a body typeface. That’s it. Whatever font you choose, opt for readability. Keep it simple. If you want to use an elaborate script font, use it sparingly and never with body copy. We use a boring font selection. That’s because we want readers to know we’re direct, we’re not flashy, and we’re focused on getting to the point. Companies using specific fonts and themes as part of their branding should be consistent too. It can be difficult to balance images used in email newsletters. We like to turn to research for these decisions, but even the data can be confusing. Some studies show that close to two-thirds of readers prefer to click to image links in emails. Other studies show that the majority of readers have their images disabled. So what do you do? First decide if images are necessary. If they aren’t, leave them out. If you use images, use alt text to describe any graph and image even if all images are disabled. And make them as clear and crisp as possible. 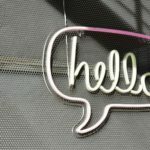 Need a resource for finding high-quality free photos? We like Unsplash. If you don’t add any new subscribers to your list, you’ll probably see your churn rate around 25% to 30%. That number includes people who complain or unsubscribe from your list. It also includes readers who don’t use that email account anymore. And it includes readers who never see your message because it goes to their spam folders. Some of the ways to improve your churn rates are to send re-engagement emails or create an option for recipients to receive fewer emails. You can remove any of the unengaged subscribers if none of these approaches work. Email marketing providers like ConvertKit and GetResponse let senders remove or segment subscribers and recipients based on their activity. That means the remaining subscribers are more likely to read and click your messages. This boost your click-through rate over all. It may also improve your deliverability, driving more clicks in the future. You can re-send your email campaign again in case your readers don’t open it the first time. Re-sending the message gives them a second chance to open your email and click your link. But if you do, use a different subject line, and try sending it at a different time. It can be the same exact content though. You may be surprised at how well this simple tactic works. In the end, the number of clicks won will determine whether your campaigns work. Your Call to Action (CTA) is the most important part. 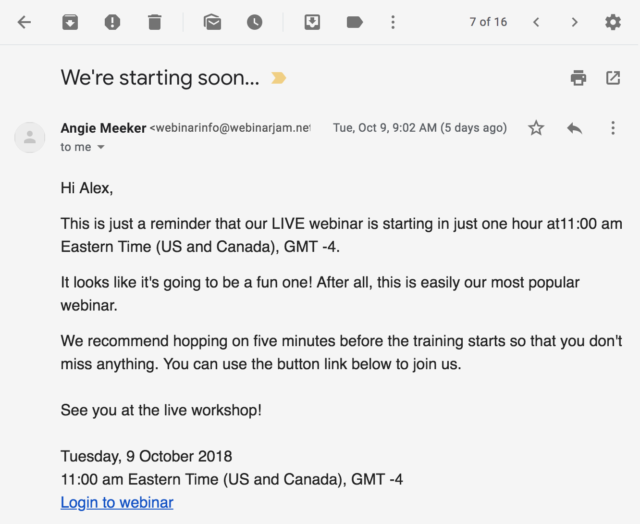 A well-designed CTA should be included in the email throughout the message. It should appear at the top, at the bottom, in different formats, and be actionable and visible. Colors and font are crucial for creating a CTA button. Experiment with their CTAs to find out whether it works for all subscribers or not. The above design tips can help marketers to create engaging email newsletters to boost their click-through rate.